Back in the old days, when we still had our trusty and bulky Oldsmobile, Dad and Mom would get everyone in, fill ‘er up at the military gas station and we would go off on fabulous family joy rides to wherever whims dictated. More often than not, we ended up in Manila, three-hour ride it might have been the long way in those days. This was in the sixties; I was a young boy; and Metro Manila was still distinct cities and municipalities that had yet to weld together into what is now this huge, congested and overpopulated metropolis. Still, even in those days, any references to “Manila” could mean any of these aforementioned cities and municipalities. Although Highway 54 – now known as Epifanio de los Santos Avenue or simply EDSA – was still not quite bogged down by vehicular traffic as it can get today, a trip to Quezon City was still shorter if one cut through what was then known as Fort McKinley. There were a few perks to my Dad then being in the Air Force. The gate sentinels instantly recognized my Dad’s Air Force uniform if he was wearing one and waved us through. Or, if my Dad was in civvies, his ID or driver’s license would suffice. Then again, this was the innocent sixties; terrorism was an as-yet unknown commodity. Sometimes, all it took was for Dad to introduce himself as an Air Force officer and we were waved through without the slightest of hassles. The haircut and patent military demeanor were always dead giveaways! 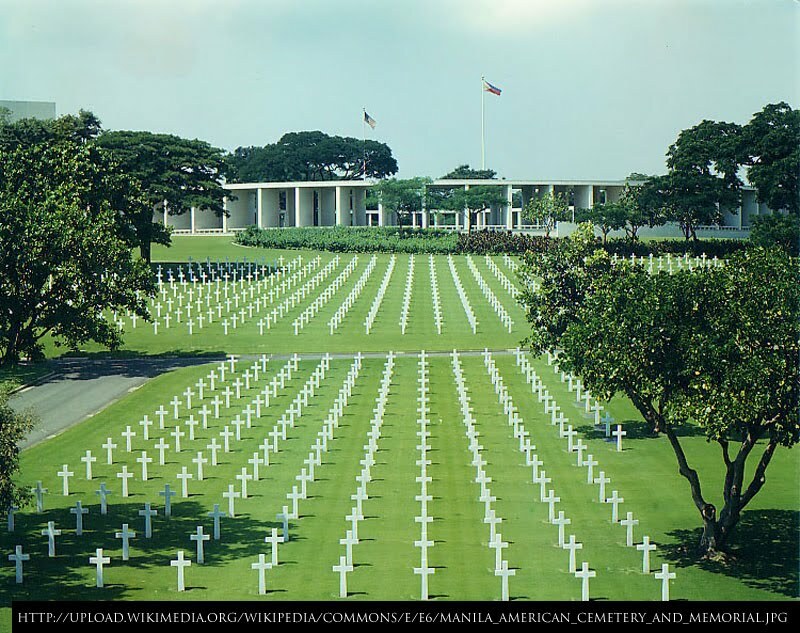 Fort McKinley was, during the American colonial era – and before it was turned over to the Philippine Government – a military reservation which was home to the Philippine Division of the United States Army. After Independence was granted to the new Republic, it would be renamed Fort Bonifacio and become a base jointly used by the Philippine Army and Navy. Those who have been inside the base also know that inside it are two large military cemeteries. 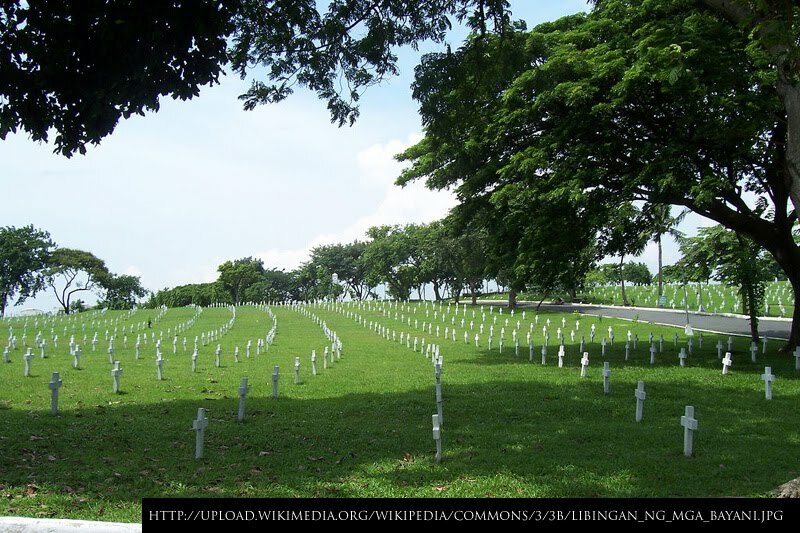 There is the Libingan ng Mga Bayani, established in 1947 as the Republic Memorial Center; but later renamed to reflect its purpose of being a final resting place for deceased military personnel, veterans, government dignitaries and national artists. Then, there is the 152-acre American cemetery, where rests more than 17,000 soldiers who gave their lives in Papua New Guinea, in the Philippines and in the South Pacific Islands so that the imperial aggression of the Japanese during World War II might be brought to an end. Marking each grave on the well-manicured grounds of the cemetery are concrete cross markers that were carefully lined in symmetric order, making the cemetery a sight to behold from afar. Whenever we passed by these cemeteries in one of our family joy rides, I closed my eyes, of course – particularly when I was much younger. It was just the way things were! Still only a kid, I was always a victim of my lively imagination. The mere sight of the concrete cross tombstones immediately conjured images in my mind of ghosts and monsters; and these, I did not wish to see! When I was older and could already make myself look, curiosity naturally got the better of me. Finding it odd that the markers were spaced too closely to one another in the American cemetery, I once asked my Mom as we passed by if the soldiers who rested there were buried standing up. Uhm… Big mistake, that question! But hey, I was a kid, remember! My idea of people being buried was nakahigâ; and because my experience of graveyards was limited to public cemeteries, I thought a grave always looked like one of those hollow rectangular concrete structures that people pushed a coffin into while everyone around it wailed hysterically. Of course, I would later learn from my Dad that the remains of the soldiers at the American cemetery were actually exhumed from temporary graves dug close to where they fell for the last time all over the theaters of war. They were then given a proper and deserved resting place as a sign of respect by those left standing for the thousands upon thousands of young men – who had hopes and dreams like you and me – called to make the ultimate sacrifice so that we may enjoy the freedom that we now take so for granted. The irony of it all was that, when I finally was able to walk the manicured grounds while on a class field trip, I saw with my own eyes that the markers were not so closely spaced, after all. They just looked that way from the highway whenever we drove by. Maybe they are all standing up somewhere for all I know! For giving up their lives for something they believed in and for allowing future generations to thrive in peace, they must be somewhere looking down at those who are not willing to forget and continue to visit the hallowed grounds under which their mortal remains rest.